I hope everyone had a great holiday. In my case, I spent the entire week at home with my family. After my Singapore trip, the past days were spent unpacking, sorting out gifts, and more importantly, resting. Most of my days were spent in bed, reading tons of book downloads and watching movies and drama series. This is life! Unfortunately, some good things must come to an end. Time flies so fast and on Monday, I will be back to work again. Hopefully, the holiday break gave me my much needed fuel to start my summer work. Teaching is over but I have a lot of backlog in my office work. Before I finally return to reality, let me recount the few good and beautiful things that made my week. Say hello to our new puppy. Hi there Zeus! The annual Easter procession which we regularly attend. I blogged about this a few years ago here. There were humps and bumps in my Singapore trip. Truth is, I wasn't totally happy with the outcome of my trip. A few hours before my return flight, someone agreed to meet up in Singapore. 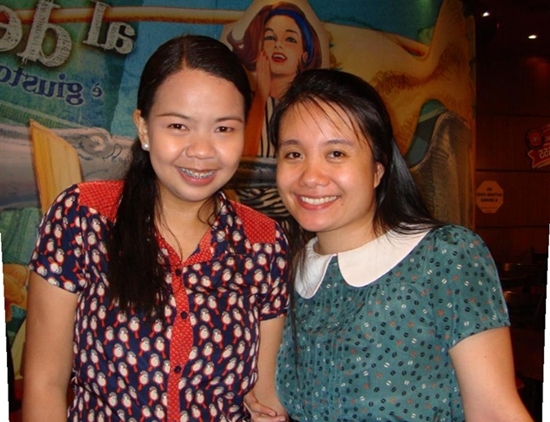 Meet my fellow Filipina blog friend, Zigrid! One thing I can say about my friend, demure to the highest level! haha Dalagang Pilipina ang peg pero super bait and accommodating. I hope you won't get mad if I exposed your beauty in the blogosphere. ;) This comes once in a lifetime and I don't often visit Singapore. Please say hi and visit my friend's beautiful blog here. Wow inggit ako di ako nailibre ni Giday.. ahahha. chos. :P Damn that virus, di tuloy ako naka-join. Tsktsk. That's so nice of you to be thinking of all your friends and family even while you are away :) And, hello puppy!